It is commonly held that controlled entries into the offensive zone generate more shots and thus we prize controlled entries more than dump and chase or chip and chase entries. Controlled entries are those where the offensive player either carries the puck into the offensive zone on his stick or makes a short pass to a teammate as they enter the zone. If a player skates a few steps into the zone and then dumps the puck in, that is a dump in, not a controlled entry. Where you see “Success” or “Fail”, it refers to whether possession of the puck was achieved after an uncontrolled zone entry. Even if there was no shot attempt, if the attacking team was able to get possession, it counts as a successful entry. In a general sense, chip and chase entries are considered dump ins because when the offensive player chips the puck in behind the defense, he loses possession of the puck. I’ve included chip and chase entries as dump ins, but I’ve also broken out chip and chase data into its own category as well. This is partially due to the fact that chip and chase entries generally seem to have a bit more success in terms of regaining possession than regular dump and chase entries do and it’s a good tool for understanding the strengths of different players. At its most basic level, 5 on 5 zone entries are usually used to identify controlled entries (carry ins), dump in entries (dump in, chip & chase and turnover entries) and failed entries. This information is very useful in not only determining the efficacy of a player or team’s playing style, but also to compare teams and players assuming you have the data available. I expanded what I track in terms of zone entries to include all strengths (4v4, Power Play, Penalty Kill, etc…) because these are all important parts of the game and give a lot of insight into teams and players. These different strengths are easy to break out from the other data to keep the noise down. 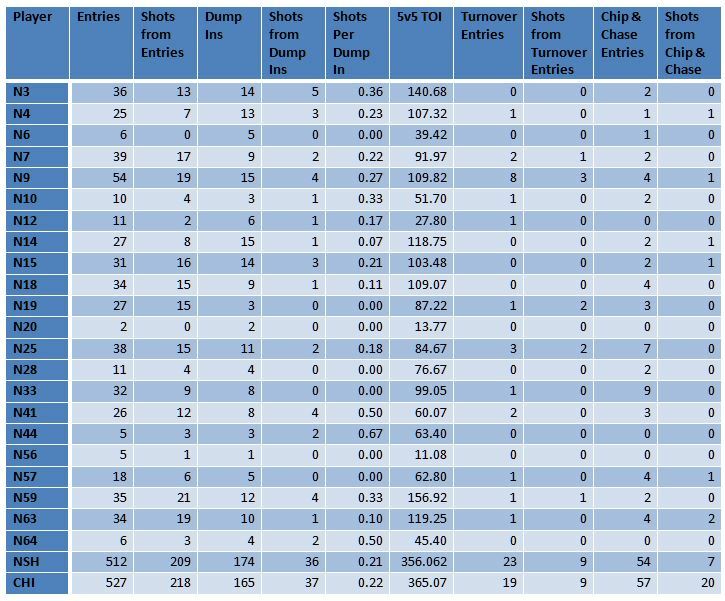 The table below includes all of the even strength (and a handful of empty net) zone entries for each player along with the shots generated from those entries. I included the empty net situations because a) there were not all that many b) the attacking team is aggressive at entering the zone and c) the defending team is aggressive at entering the opposing zone as well during empty net play. The shots are calculated as Fenwick or USAT events, which are all unblocked shot attempts. This includes shots on goal and missed shots. It is fairly simple to include all shot attempts (Corsi or SAT), but unblocked shots are what I use during the regular season so I just stuck with that. Keep in mind when looking at the shot generation rates and entry rates that this is a small sample size compared to what we would normally use over a season’s worth of games, so they are heavily affected by time on ice. Looking at the basic zone entry table, we see that Filip Forsberg and Matt Cullen led the way for Nashville in controlled zone entries. Forsberg’s entries led to more shots and when entries other than carry ins are included, it’s clear that Forsberg was a key to Nashville’s offensive push. Defenseman Roman Josi and Forward Mike Ribeiro led the Predators in shots generated from controlled zone entries overall during their series against Chicago. When we look at shots generated from dump in entries, Filip Forsberg has the highest number. He and Viktor Stalberg have very high numbers of dump in entries, which when you think about their style of play seems odd. Brandon Saad led the Blackhawks in controlled entries and shots generated from his controlled entries. Kris Versteeg and Marian Hossa finished in a tie for second in shots generated from their controlled zone entries followed by Patrick Sharp, Patrick Kane and Andrew Shaw. Versteeg’s numbers are all the more interesting since he has been in the press box for the first three games of Chicago’s series versus Minnesota. Teravainen, who had some struggles against Nashville’s neutral zone forecheck, has taken his spot in the lineup and done quite well. When we include shots generated from all types of zone entries, we again find Brandon Saad at the top of the list, but Hossa takes over sole possession of second. Kris Versteeg was third on the team with Sharp and Kane behind him. Controlled entry percentage leaders: Vermette (4 games), Teravainen (2 games), Richards, Kane and Toews. 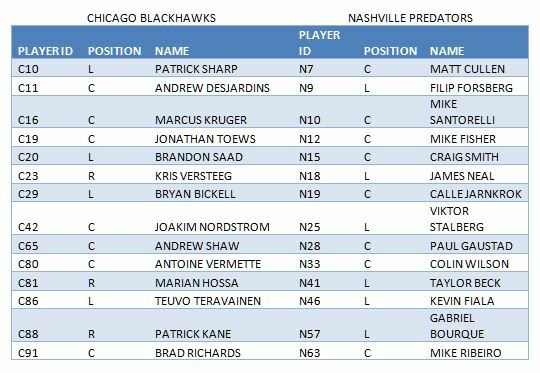 Seeing players farther down the depth chart, such as Shaw, Versteeg and Kruger, doing well carrying the puck into the zone and generating shots is evidence of the match up problems both teams faced during the series. Chicago has long held to a three scoring lines one checking line format, which has been one of the keys to their playoff success over the years. Nashville has been developing this more this season, which was part of what made them successful. When the top lines matched up against each other, Jarnkrok, Cullen and Stalberg were able to generate offensive pressure for Nashville, much like Shaw, Kruger and Versteeg were able to do for Chicago. Scoring depth leads to difficulties in getting match ups that can limit offensive pressure and opens up opportunities for the first and second lines. Because star lines often cancel each other out in the playoffs, throwing a wrench in the opponent’s plan for line matching can lead to good things. That was a tall order in this series because both teams had good depth and were aggressive in pushing their offensive attack. This is where I think zone entry data gets really interesting. When we break down the general categories a bit, a clearer picture of how the teams and players approached the game emerges. While Carry In entries remain the same, I refined the Dump In entries so that we have three categories instead of one. Dump Ins are the traditional dump and chase style entries where a player fires a hard shot (or deflects the defenseman’s hard shot) deep into the zone and the attacking team goes in on the forecheck to regain possession of the puck, often near the end boards. Chip and Chase entries are those where the puck carrier makes a soft chip either off of the boards or around the defending player and immediately attempts to regain possession, often from the faceoff dots or higher in the zone. Turnover entries are those where the defending player has the puck in his zone and is preparing to start the breakout when pressure from a forechecking player causes him to turn the puck over. Below are the tables for Even Strength play with these additional categories broken out. When we looked at the Predators’ basic entry sheet, both Forsberg and Stalberg had a lot of Dump In entries, which, if you’ve ever watched them play, is inconsistent with either player’s style. When we break down the Dump In entries, it is easy to see why this seemed off. Forsberg went from 27 entries that would be considered Dump Ins to 15, because an astounding number (8) of his zone entries came from forcing a turnover in his opponent’s defensive zone after a Chicago had brought the puck back in to start a breakout. An additional 4 of his Dump In zone entries were actually Chip & Chase entries as well. Stalberg went from 21 Dump In entries to 11, with 3 of his zone entries coming from turnovers and another 7 from Chip & Chase entries. This is far more consistent with Stalberg’s style of play which seeks to maximize his incredible speed. Brandon Saad’s numbers changed dramatically as well when broken down. He went from 22 Dump Ins to 9 with 1 entry coming on a turnover and 12 from Chip & Chase plays. 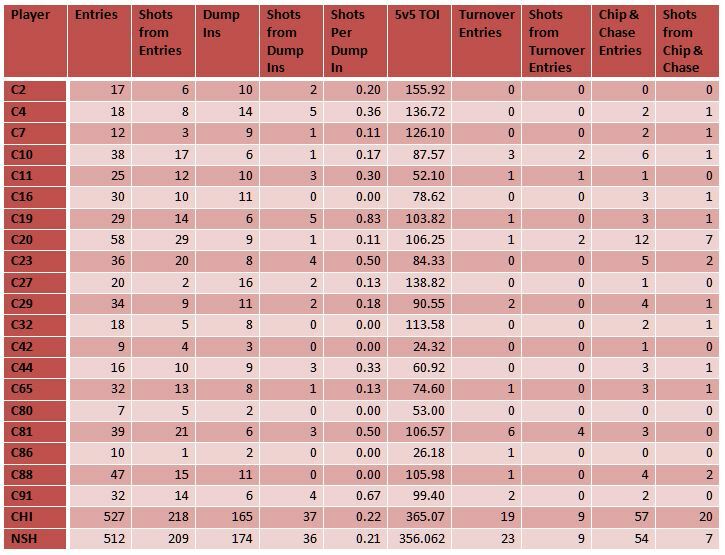 The most interesting thing about this is that with the basic entry numbers, Saad looked to have generated 10 shots from Dump In entries. This is often indicative of a player, or his linemates, being very effective on the offensive zone forecheck; however, when his entries are further scrutinized, we see that only 1 of those shots was generated from a traditional dump and chase scenario. 7 shots were generated from his Chip & Chase entries, which is very impressive. 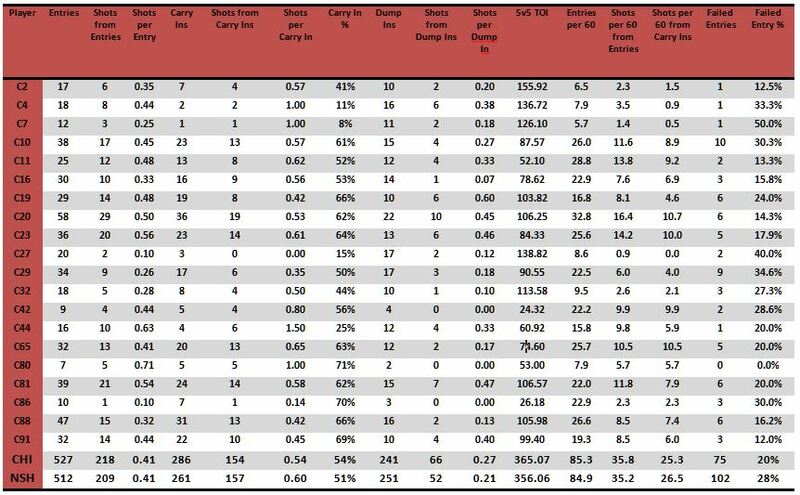 Patrick Sharp showed a very similar change to Saad in that the shots generated did not come from Dump Ins, but instead were from his 3 Turnover entries and 6 Chip & Chase entries. Marian Hossa also showed a pronounced change in his numbers that better describes his style of play. Hossa went from 15 Dump Ins to 6 due to having an amazing 6 Turnover entries that generated over half of the shots he was credited with on the Basic Entries table. 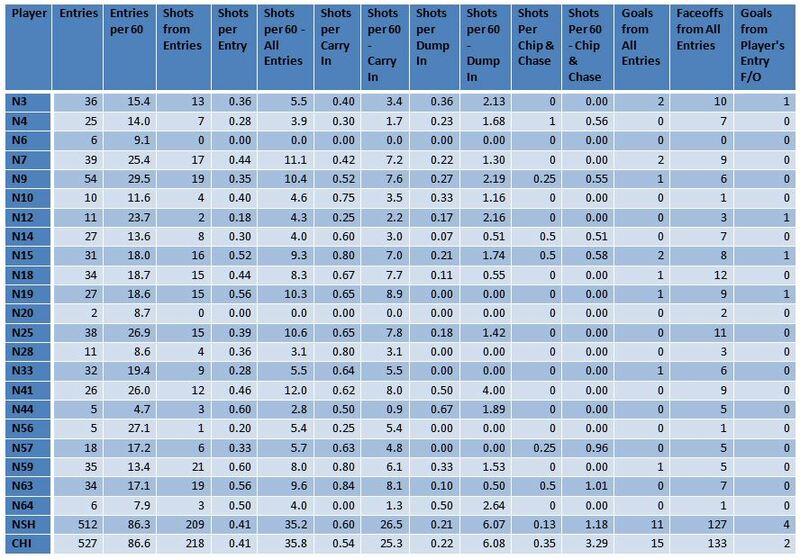 Versteeg, Bickell and Kane also used Chip & Chase entries quite a bit as you can see from the table. Aside from just looking at how the players entered the zone and the shots they generated, we can also add additional information to learn more about how effective different players or lines are at generating offensive pressure. 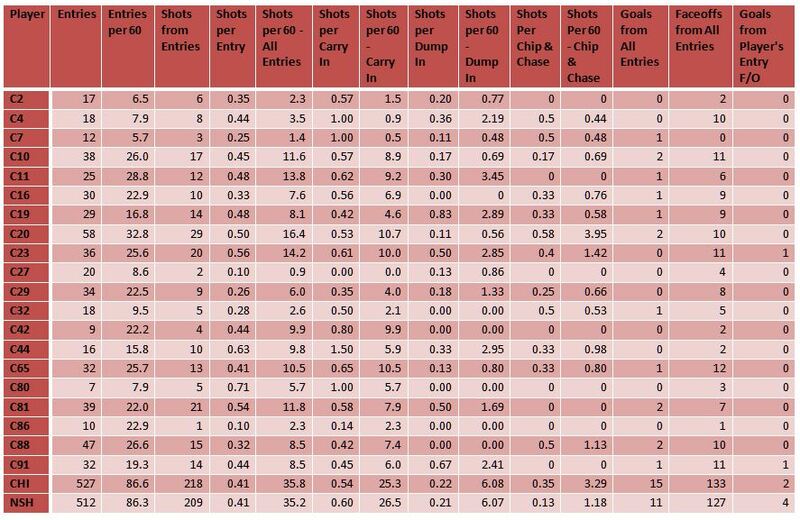 Below is a table that includes shot rates (Shots Per 60 from various types of entries) and also the faceoffs and goals resulting from the entries by the players. The faceoff data is very interesting. Faceoffs in the offensive zone are most frequently the result of the goalie having to freeze the puck due to heavy offensive pressure. On the faceoff, teams not only have the opportunity to use a set play, which in hockey is tough to come by, but also to put different players on the ice. An offensive zone faceoff gained by the checking line’s zone entry allows the team to put one of the scoring lines in to increase their likelihood of success in scoring. This table is once again a good illustration of how depth in a team’s forward lines allows the higher lines to be more productive, particularly in the playoffs. There is great value in getting faceoffs in the offensive zone at a high rate from the offensive attack of players like Stalberg, Cullen and Beck. This allows the big name offensive players more opportunities to put points on the board and lead the team to success. Again, faceoffs due to the offensive attack of players like Kruger, Versteeg and Shaw mean a lot to opening up space to work for the players on the higher scoring lines. Another interesting thing about this table, small sample size of course, is the rate at which Saad and others generated shots with the Chip & Chase. This type of information, particularly over the course of a month or so in the regular season can help coaches make decisions about the style of attack with certain players on the ice. There are countless possibilities for what can be measured from this type of data over the course of a season. 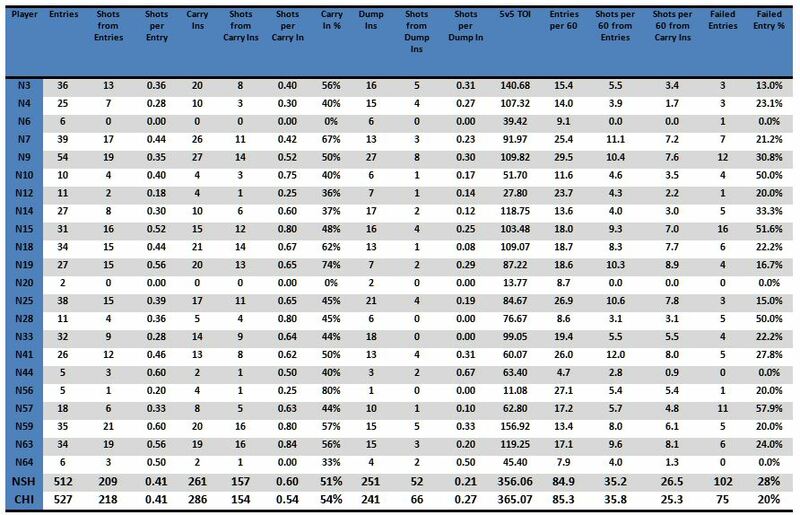 I hope you enjoyed getting an in depth look at the zone entry data from this series and some of the possibilities for its use in the regular season. The next article in this series will be on Defensive Targets and should be posted soon.